Today is the third day of Diwali. It is also Laxmi Pujan. Laxmi, also written Lakshmi, is the Goddess of Wealth. In our family, it was mostly those with businesses who did Laxmi Pujan. Invariably, it meant a trek to my great-uncle's studio near Chowpatty Beach (in Bombay), with each one of us decked up in our new Diwali finery. As kids we didn't really care about the Puja. We were more interested in the Cadbury's Dairy Milk bar that Anna-mama would give every one of us. It was a long thin bar, almost like a single serving that was not cut into squares. After that, we'd beg to be taken to the beach, not to swim but to eat bhel. Our stomachs were like insatiable pits on that day because as soon as we got back, we'd plead for some ice-cream from the vendor down the street. I don't remember a thing about the puja! Later on I found out that this was called Chopda Puja in Gujarati. Chopda means books and, quite literally, the large journals that were the Books of Accounts were worshipped. After we started our own business, I remember doing a brief aarti of our computers - they were our lifeline in every way and also stored our Books of Accounts! and, yes! More nankatai! It's Recipe #2, baby! I am on the top of the world! Amazing how much I do not know about your rituals. Thank you for sharing. Manish I am so happy that finally I get to meet someone who doesn't need to do "puja", because even I believe in the same and really appreciate your putting my (and yours too) thoughts into such beautiful words! So you have one more thing to be grateful for this Diwali - you finally found your mother's recipe! Looking forward to pictures and the recipe. I am also looking forward to more pictures and recipes. Hi.. Been following your blog for a few months. Great post. Love that savory- kaccha chivda. Can't wait for your recipe to be posted so I can try it on my own. My mouth is watering!!! 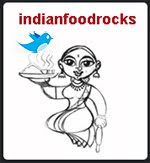 Hey Manisha, i am looking forward to the much cherished recipe :). i can completely understand the excitement and joy you must have felt in discveering the recipe from your Mom's diary. i tell you, Moms are special and anything they do, is most definitely special and adds something extra to our lives :). and i agree with Anita :). Nankhatais are one of the few sweet bakes that i make, so i am excited too :). Happy Diwali to you and your family, dear! The kacha chivda is saying, "plz have some" :). My family also follows this tradition. But quite frankly, I don't agree with chanting mantras and performing rituals. Kaccha chivda looks great.Nice post. Latha, I don't know the Lakshmi Ashtotram so I looked it up and found a lovely rendition by M.S. Subbalakshmi herself! We're Ganpati fans and I love to listen to the Ganesh Mahamantra as well as the Ashtottar. Both chants used to agitate me initially; it's only in the last couple of years that I have been able to listen to them completely and enjoy the inner peace they bring. I find myself seeking these chants when I need to destress. Marysmom, we are by no means a typical Indian family when it comes to tradition and rituals. We have always carved our own path and also, taken what appealed to us. There is a lot I do not know and I regret that sometimes. Bindiya, thank you! It is true that you don't need to go to a temple to pray. And that analogy can be extended over and over again. Anita, you bet! The nankatai recipe is up! Jayanthi, welcome to IFR! 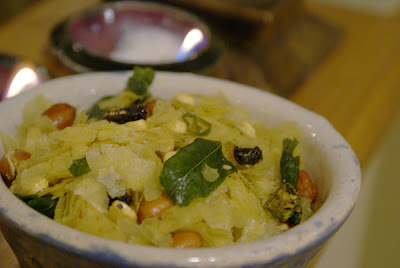 I'm hoping to post the recipe for kaccha chivda soon. It's a recipe I got from a very special woman, my sister's mother-in-law. Musy, Moms rule! Check out the recipe - it is not all that sweet. And I think you could probably play with the proportions to reduce it further (increase flour; reduce sugar maybe?). Do let me know if you try them out! I'd like to know how long they take to bake at sea-level. I made chivda from 1 lb of pohe and certain little people didn't have dinner last night because they pigged on it! Kribha, to each his own. :-) Quite honestly, I didn't understand the rational behind chanting or performing rituals till much later in life. Chants can invoke different emotions based on the frequency, the tones, the melody, the repetition. They can be meditative, trigger introspection, be a cheer (Chak De!, for example) even. Buddhist chants are the most inspiring. You only need to open yourself up to feel what the chant can bring to you. And it is the same with rituals. We can take from society around us or we can even create our own rituals. They are symbolic. According to me, celebrating the birth of a child is the most common ritual there is. It celebrates life and there is much joy in it. No? If you can look beyond what "they make me do" or "what I have to do", there is a lot of beauty in our customs. It is customs that make society what it is. Partake of those that appeal to you, discard those that make you feel uncomfortable. Celebrate. On your own terms.